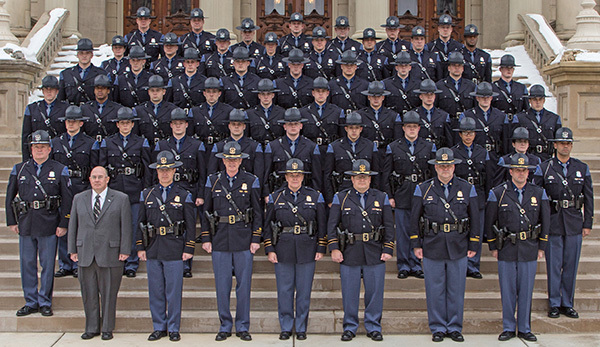 Tag Archive | "recruit school"
Twenty-eight new Michigan State Police (MSP) troopers will report for work at MSP posts across the state next week after graduating from the 132nd Trooper Recruit School last Friday, February 10. Col. Kriste Kibbey Etue, director of the MSP, administered the Oath of Office during the ceremony at the Training Academy. Ruffer who received the Team Building Award and Tpr. Curtis Alward who received the Outstanding Performance Award. Four of the trooper grads will be serve in the sixth district. Tpr. Grant Huber, of Clarkston, will serve at the Rockford post; Tpr. Jacob Grinwis, of Whitehall, will serve at the Hart post; Tpr. Maya Hairston-Moore, of Lansing, will serve at the Mount Pleasant post; and Miguel Mendez-Ibanez, of Lansing, will also serve at the Mount Pleasant post. The 132nd Trooper Recruit School began on Aug. 28, 2016, when 37 prospective troopers reported to the MSP Training Academy in Lansing. For the past 24 weeks, recruits received training in firearms, water safety, defensive tactics, patrol techniques, report writing, ethics, first aid, criminal law, crime scene processing and precision driving. As part of the department’s commitment to “Providing Service With A Purpose,” the recruits participated in a community outreach project in which they assisted in building a playground at Wacousta Elementary School. The 132nd Trooper Recruit School is the fourth of four trooper recruit schools started in 2016, as well as a motor carrier officer recruit school; a first in the department’s 100-year history. The MSP is actively recruiting for a trooper recruit school anticipated to begin in June; interested candidates should visit www.michigan.gov/mspjobs for more information on how to apply. Including these new troopers, there are currently more than 1,050 troopers assigned statewide.